As many of you know, one of my go-to breakfast/snacks for the busy work week are my Bananarama Bars which were featured on Yahoo! Shine recently. A few weeks ago, I had an absolutely amazing time teaching a healthy eating/nutrition course coupled with a cooking class at the US Air Force Base Health and Wellness Center- we had seven cooking stations, one of which was the Bananarama Bar station. It was such a fun and motivated group and everyone did such a great job making the snacks! At the end of the class, we had an absolute feast! The Bananarama Bars are great because with just a little prep over the weekend, you have a healthy and tasty grab and go breakfast or snack that will hold you over for hours. These are fabulous when you are craving something a touch sweet, but what about when your savory cravings kick in? That's when I realized it's time for a make-ahead bite that will satisfy these foodie desires :) I love the combination of spinach and feta- Spanakopitas are my favorite! 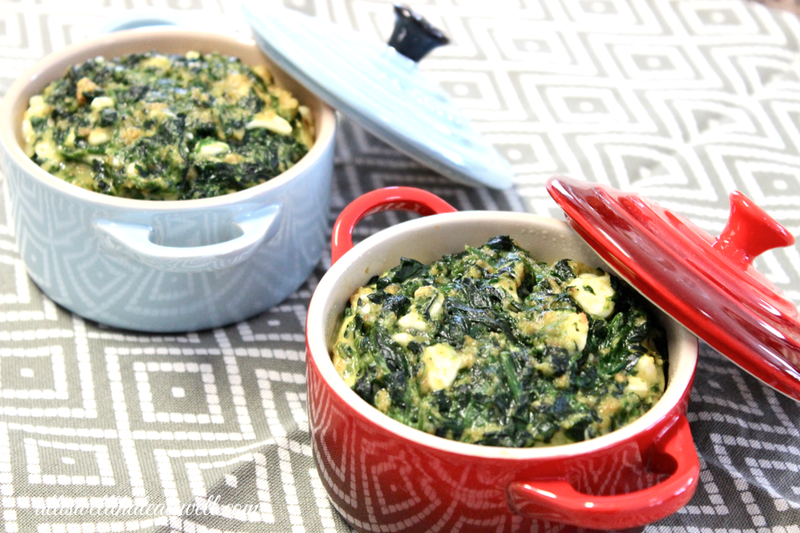 These spinach and feta bites are so easy to whip up and they make use of just a few ingredients that most of us have readily accessible in the kitchen. At just 1.5 weight watchers points per bite if you make them in a muffin pan, this good-for-you AND delicious snack really hits the spot and if you really want another, go for it! Sometimes on weekends, I turn this into a breakfast/brunch and cook them up in my Le Creuset mini cocottes- they are just so cute and end up being a mere 5.5 weight watchers points a serving. Children love them too and they may be just the trick to get your kids to eat more veggies! Enjoy these tasty bites! 1. Preheat oven to 350 degrees. Combine all ingredients and dish into muffin pan or oven safe cookware. 2. If using muffin pan, remove after ~25 minutes. If using larger cookware, will likely need to be cooked longer depending on size.